Set in contemporary Montreal, This Life is a family saga focusing on Natalie Lawson, an accomplished columnist and single mother in her early forties whose terminal cancer diagnosis sends her on a quest to prepare her teenage children for life without her. Her tight-knit family - sister, two brothers and parents - do the best they can to help her, while coping with their own responses to this revelation. THIS LIFE is a funny, honest, heartfelt series about a regular family whose world turns upside down overnight. Faced with the uncertainty of life, each Lawson does their best to embrace the absurdity of the journey, while confronting the drama that comes with all of their choices big and small. 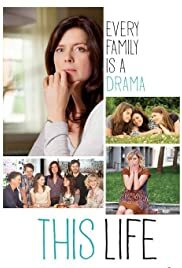 In Montreal, Natalie Lawson (Torri Higginson) is a divorced mom to three teenagers. Her life gets more complicated when she is diagnosed with terminal cancer. Everybody in the family has issues including her siblings and her parents. I like the characters and I like the actors. It makes their trials and tribulations more compelling. And boy, there are loads of trials and tribulations. It's melodramatic but in a good way. It does get overwhelming by the second season. It doesn't get a third which is probably for the best. It wasn't getting traction and without American distribution, this Canadian show didn't have a chance.